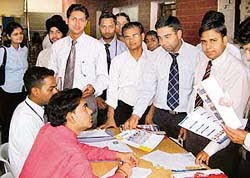 The Rotary Club of Vijayawada Central proposed to conduct a job mela for degree-pass unemployed youth on September 12. Candidates who passed D.Pharma and B. Pharma can also apply. No age-limit has been prescribed for the applicants. Aspirants can submit their bio-data at Yasasvi Diagnostic Centre on Dornakal Road near Andhra Bank ATM in Suryaraopet. Further enquiries can be made by contacting Rotarian Ch. Ramchand on phone no. 93935 73414.